Happy Halloween from all of us here at Crafty Card Gallery!! I hope each of you have a safe, but fun Halloween. 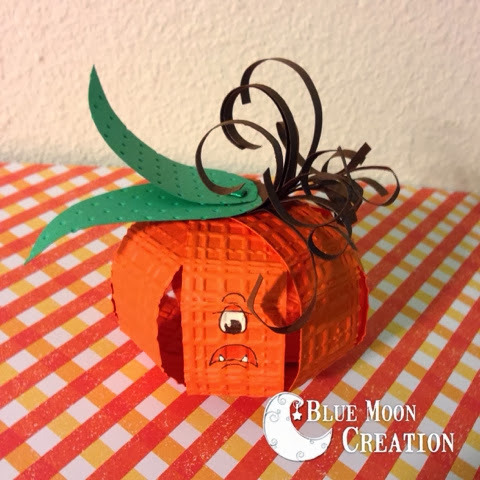 Today’s my DT day and I’m sharing with you a twisted easel card with a cute digi Glitterella Picked A Pumpkin by Sherri Baldy. This month’s design team has brought to you many pumpkins and my card is no different…lol. I hope you like it. Front View of the card when it is closed. It measures 5×5. Close up of Glitterella. I wish you could see all the sparkle that is on her but the camera would not pick it up. You can see all the details of how I made this card on my blog http://www.scrappinwithz.blogspot.com Well, that’s my card for this last day of October. I hope you like it and come back and see what the Crafty Card Gallery Design Team will bring to you in November. Hi all you crafty folks! 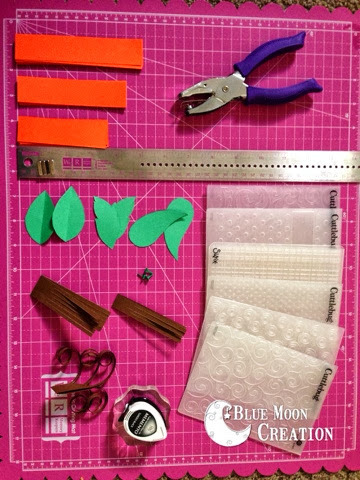 Thia here from Blue Moon Creation with my DT post for Crafty Card Gallery. Now with that much stuff, you can make 3 pumpkins. Each pumpkin needs about 6-9 strips of one inch wide paper 4-5 inches long. Punch holes at each end of the strips and run through your embossing machine. (Note: sometimes it really thins out your paper in places and the paper will rip where embossed when bent.) Punch holes in leaves and the brown strips. (Brown strips can be curled with a pencil.) With a long brad, place the leaves and brown paper on first, then the strips. Secure. Now here is the tough part…you can push another brad through the hole at the bottom of the orange strips and secure. Now the tricky part of fanning it out. Separate the middle of the stack of orange strips. Squash down and fan out the strips to make a ball. You can add candy or dinner mints, depending upon your use. 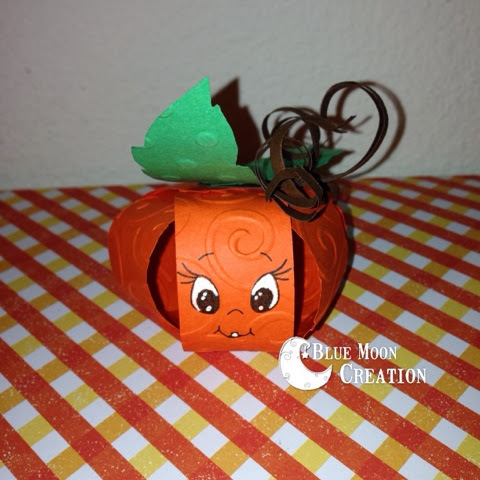 I hope you enjoyed these cute Paper Pumpkins! Thanks for stopping by! If you would like to see more of what I’m up to, please feel free to stop by my personal blog and say hi! I hope to see you there! Valentine’s Day Card with a Difference! Today it’s my turn to grace your screens with a card! Our assignment this month was to showcase a card that either had a pumpkin, was about Fall, or featured orange as the colour. Since we don’t celebrate Fall in Australia, and the majority of people don’t celebrate Halloween either, I decided to make a card using orange as the main colour. I picked up a sweet Penny Black image stamp at a recent craft show, and have used it on my card. The greeting is from an Australian stamp company, Inspired by Stamping. Hi everyone!!! It’s me, Tonya and I’m here to share two cards I created for our monthly challenge over at the Crafty Card Gallery. The theme for this month is pumpkins and this is the cards I came up with. The next card I used Damask Black and White cardstock for the base of my card which I inked all edges of with Martha Stewart Stem Green Chalk Ink. I also used scraps of cardstock, buttons, Dew Drops, a doily that I glimmer misted with Tattered Angels Peach Delight and the 31 is cut from Sizzix Funky Brush dies. The vintage pumpkin image (I cut the image down) I got from Ephemera’s Vintage Garden. There are five more Halloween images that are perfect for cards too. If you have any questions about either card please let me know. Thanks for stopping by today and I hope your Friday is wonderful and enjoy creating!!! Stamps for Ghost, Pumpkins and Sentiment are from Get Inky! Stamps 2013 Spooktacular Halloween Set. The clouds are from Get Inky! Stamps Whimsical Moon and Stars. The fence is cut with my Creative Memories Border Maker System and the Spooky fence cartrtidge (RETIRED). The buttons are Stampin’ Up and the tree was cut with my Cameo Silhouette. I decided to make the ghost peek out from the pumpkins to say BOO! Thanks to Crafty Card Gallery for having me today. Until next time…. Fall is in the air…. Hello Crafters…Nancy here today with a very Clean and Simple card for you! with orange on it instead! 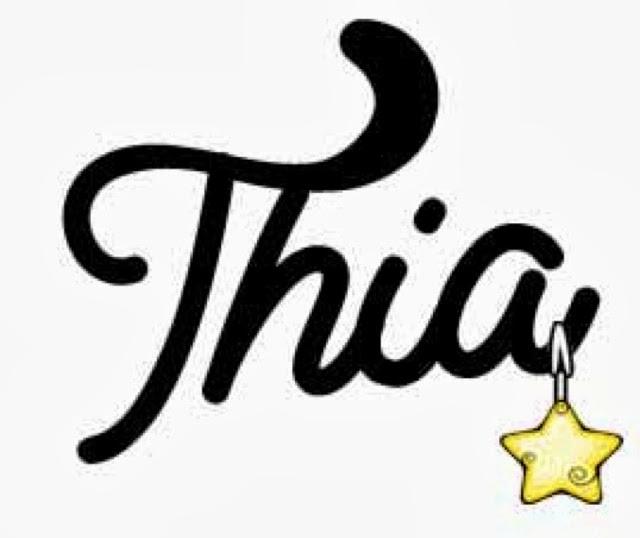 The stamps are a mixture of Gina K, Close to My Heart and Stampin Up. Here is a link to my blog for more details! Hope you have a wonderful creative day!